Five award-winning magicians are set to appear together for one night only – and then vanish into thin air. A unique blend of cutting edge illusions, mystery, music, comedy, audience participation, and precision sleight of hand is definitely not your average birthday party magic show. Kel will be joined on stage for M – The Magic Show at the Michael J Fox Theatre in Burnaby on October 21 by Wes Barker, who has appeared on Penn & Teller: Fool Us, America’s Got Talent, and Wizard Wars; comic magic team Trevor & Lorena whose more than 20 international awards include Siegfried and Roy’s “Golden Lions Head”; and Vitaly Beckman, whose performance includes “Super Vision,” where he demonstrates his ability to read books and newspapers from a 50-foot distance. 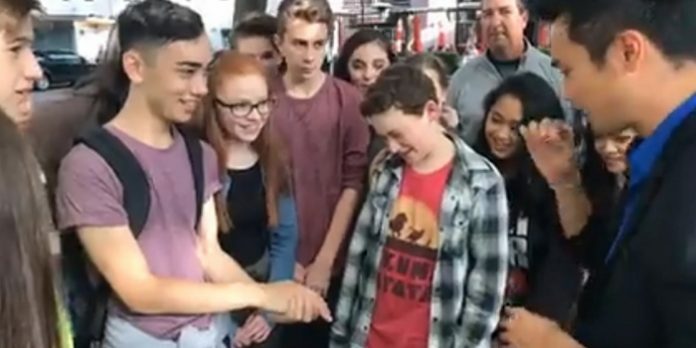 Vancouver Presents contributing editor, Mark Robins, was live on Granville Island with illusionist Kel to chat about the upcoming show, and entertain the crowd with a little magic too. M – The Magic Show plays the Michael J Fox Theatre (7373 Macpherson Ave, Burnaby) on October 21. Tickets are available online.